You all must have known about the Sales we get to enjoy at our Independence day, this year Sapphire, Beech Tree and Ethnic they all had Flat 50% OFF . On the morning of 14th August I decided to visit Dolmen City Mall, usually I avoid going to the mall on such days because of extreme crowded situation but this was an exception as there were a lot of sales and I wanted to buy a lot of gifts. 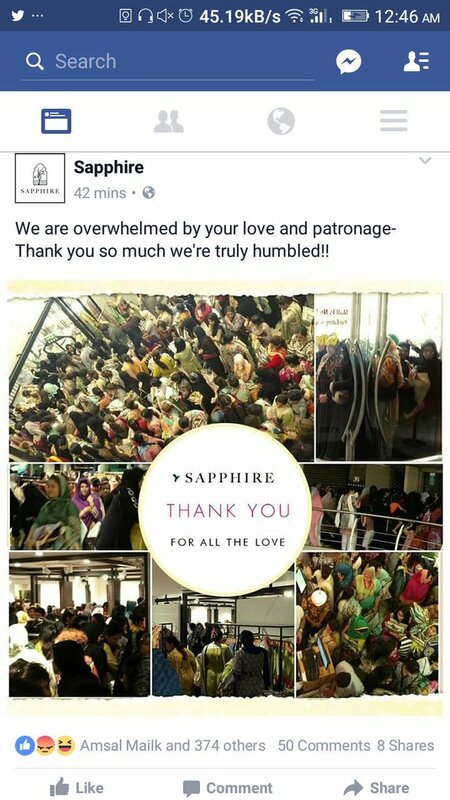 I reached there around 12 O’ Clock & I thought that being this early I might be able to pick up something good from Sapphire but I was wrong, the whole store was filled with women holding 10 to 12 piece of clothing in their hands , but there was nothing on the shelves. So no luck at Sapphire again! I have always loved Beech Tree and was really amazed to see so much variety & shelves full of wonderful clothes. I got Five Shirts and Five Pants from Beech Tree that too in amazing prices, I even gifted half of of the stuff . I checked out very happy with my purchase and after an hour or so decided to visit again and trust me all the pants n trousers were gone and half of the racks were empty and this time it was too crowded though I wanted to get a few more pants but left without buying. Well Done Beech Tree, Keep it up. Next was Ethnic, it also offered FLAT 50% OFF and I loved most of the stuff got two pants and a shirt ( which I already have gifted so won’t be able to show pictures) but mostly sizes were limited, but then again the SALE was good, the racks had good variety of clothes on them & the staff was very helpful. How was your experience? Did you get anything from these sales?